Kevin has been with SunCommon since 2013 and has helped over 600 Vermonters go solar. He enjoys swimming, skiing, taking photos, or exploring the fields around his Weybridge home with his English bulldog, Sonny. He also gets great pleasure from food, both with a fork and with a chef’s knife, and has traveled to over 20 countries. Kevin’s professional background includes Energy Planner for the Addison County Planning Commission, Product Manager for Sunward Solar, and Catalog Director for his family’s business, Lehman’s. Kevin has an MBA in Sustainability from the Marlboro College Graduate School and has served on the Boards of the Middlebury Natural Foods Coop and the Addison County Relocalization Network (ACORN). 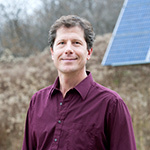 Kevin is thrilled for the opportunity to help Vermonters re-power their homes with clean energy.